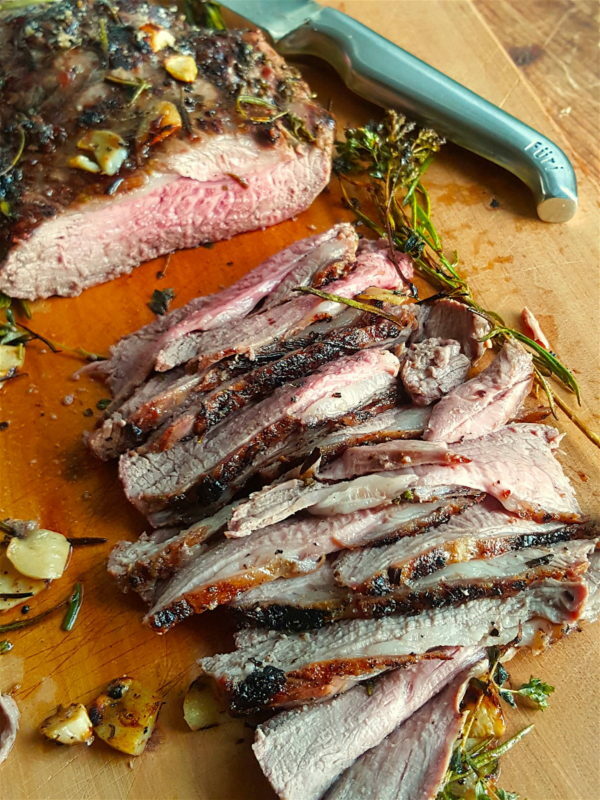 Boneless legs of lamb are quick to cook on the barbecue and are deliciously juicy and tender. 1 Pat meat with paper towels. Trim if necessary. 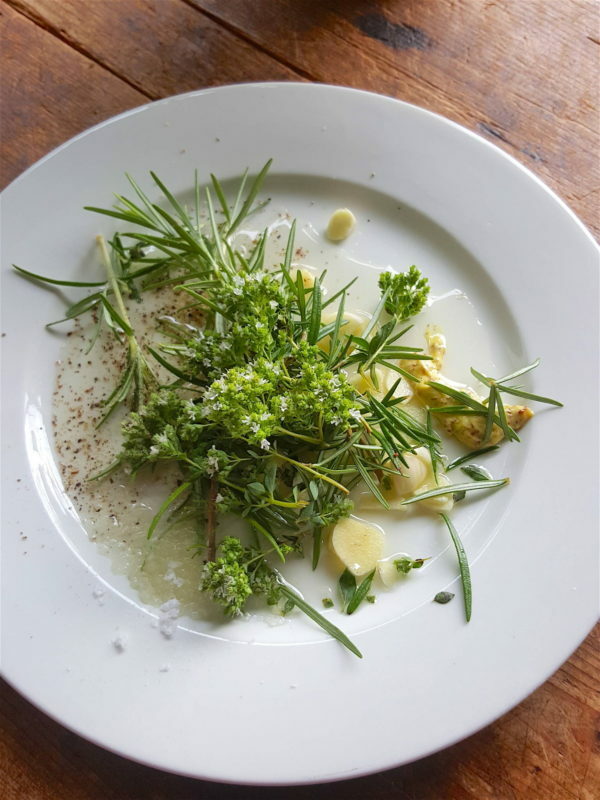 Put oil, mustard, garlic, herbs and seasonings in a dish and stir together. Add lamb and coat all over with the marinade. Cover lamb with a food umbrella or similar and leave at room temperature for about 40 minutes. 2 Preheat a covered barbecue; I use a small Weber barbecue and preheat it on high for 10 minutes. Toss lamb in marinade, picking off garlic and herbs. 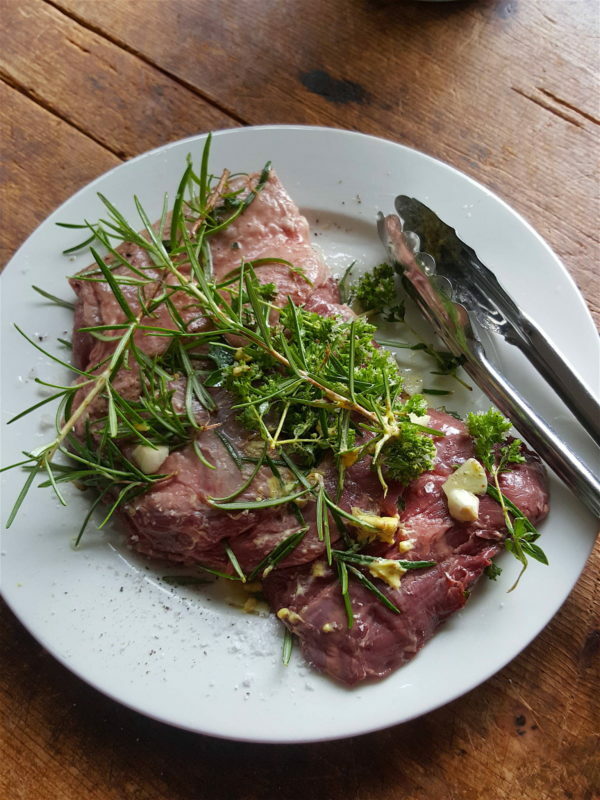 Place lamb fat side down on barbecue and strew the top with the garlic and herbs. Lower barbecue hood and turn gas to low. 3 Cook for 7 minutes. Turn lamb over and cook for a further 5 minutes. If the lamb weighs more than 600g you may not have to cook it any long – it is the thickness, not the length that affects cooking time. See notes below. 4 Remove lamb to a board and sprinkle all over with salt. Rest lamb for 5-7 minutes, then slice thinly with a carving knife. 5 Serve with salad, in buns or sliders or with vegetables such as eggplant and peppers. I like it on grilled bread spread with Cannellini Bean Dip and salad leaves and topped with fried or barbecued eggplant slices and grilled or slow-roasted tomatoes. Scrumptious. When the lamb feels flabby, it is rare. When it feels springy it is medium-rare, if it feels firm, it is medium and if it feels hard it is well done. I like it cooked to medium-rare. It will continue to cook a little more as it rests and will remain juicy. If the piece of lamb you have is uneven, with a thicker chumpy bit, cut the chumpy bit off and cook it a little longer that the rest of the meat. In my books the worst thing you can do to a beautiful piece of meat like this is to overcook it. Keep it pink and juicy! Maximum 12 minutes! Be brave! Yes, lots of exclamation marks, but I need your full attention. And I’m not sure chumpy is a word but I reckon you can work out what I mean. The Furi knife arrived thank you. So far put aside for a special gift but it looks tempting for my own use. I really look forward to Shared Kitchen — keep up the good work ! That’s great Shirley Ann. A good knife makes chopping so much more pleasant (lucky person who receives the gift). I’m glad you enjoy Shared Kitchen. Hmmmmm,…… as soon as this winter here up in New Hampshire is on its way out, I’ll put the grill out on the deck and check this out! Of course, if I had a magic carpet I’d scoot on down to Waiheke Island, tell you I was coming, and be hanging out for one of your delectable menu items! HaHa! Well just put Waiheke on your wishlist Rex an I’ll gladly fire up the barbie for you. 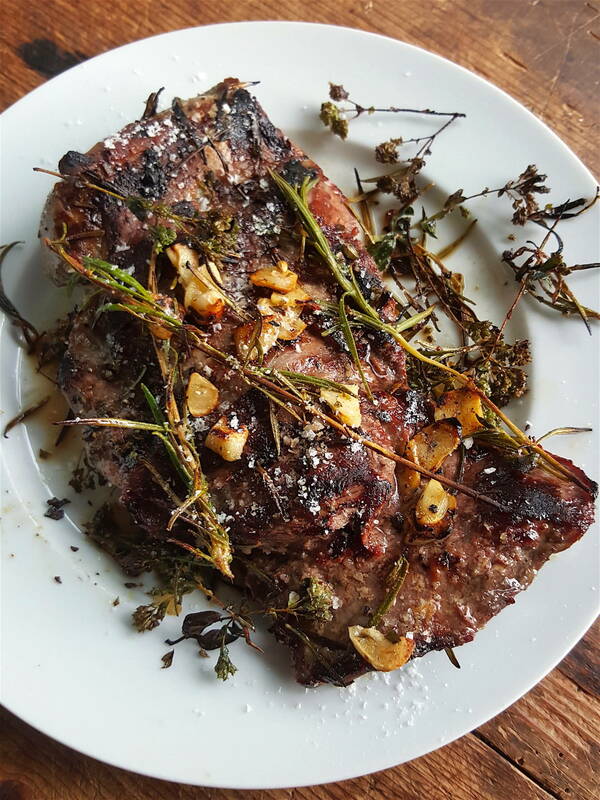 looks lovely – do you put it on the grill or the plate on the weber? Well that’s an interesting question Dale, because my baby Weber only has a grill plate. There are a couple of small solid bits on it, but it is about 80% bars, so my answer is on the grill. The grill rack separates so maybe I am meant to buy a separate plate for half of it. I will have to investigate! An excellent result Dale. Sometimes you just have to give things a try because on paper it can be hard to imagine the result.